Maybe you fall into the same category as me or maybe you don't really pay attention to this sort of thing. But, I love when record labels have a good email mailing list that keeps you up to date on the goings on at the label and announces any new records that are on sale. Some may view this as spam, but I view it as information vital to keep me on top of things. 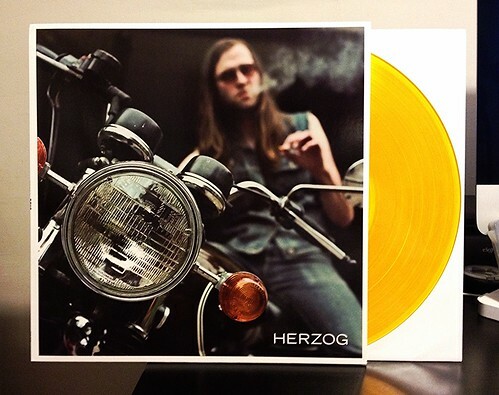 Case in point is this Herzog LP. Honestly the only reason I heard about it was because I ended up on Exit Stencil's email list (presumably after buying the great Chomp record a couple of years back). The description caught my eye, so I took a chance on a band I'd never really heard of before. It was definitely a risk worth taking. The album starts off right away with "Full Stick," a big drum beat, guitar driven blast with a melodic verse that just reeks of energy and enthusiasm. It's short, but is an immediate attention grabber that sets you up for the rest of the record. From there on out the album is comprised of song after song of huge hooks & melodies, gigantic fuzzy guitars and some pretty great vocal melodies, especially considering the band's penchant for a little vocal static in their production. It's got the kind of Blue Album catchiness that I love, with a slightly lower fi production that keeps it sounding fresh and exciting. Just listen to the bouncy, lead synth soaked "Mad Men" and I dare you to tell me it's not one of the catchiest songs you've heard this year. It's just a great album top to bottom and absolutely one worth being on some email mailing lists to find out about.